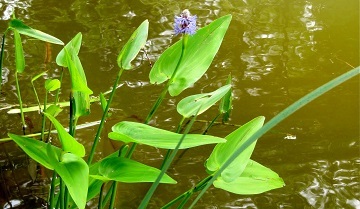 Arrowhead has large arrow–like leaves and white flowers. Arrowhead gets its name from its arrow shaped leaves which come to 3 distinct points. The leaves grow in clusters from the base and can grow up to 4 feet tall. The stems of the leaves are spongy and leak a milky fluid if crushed. Arrowhead has flowers at the end of its stalk which are typically in whorls of 3, and can be white to light pink in color. This plant tends to like high phosphate levels and hard waters. The roots of these plants were often eaten by indigenous people, giving them the nickname "Indian Potato." Can be found all over the United States and Southern Canada. A variety of herbicides can have an effect on Arrowhead. Hydrothol and Spritflo® herbicides are great options for controlling this plant. You can purchase these products on this website.